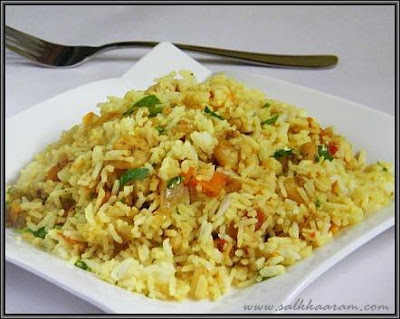 Prawn Pulav / Shrimp Pilaf | Simple and Delicious ! Heat oil in a heavy bottomed vessel , allow cumin seeds splutter. When it is semi transparent add carrots and continue stirring. When onion is slightly brown add garlic and ginger paste, chopped tomato and powders. Add salt and cook until the tomatoes are mashed well. Add prawn and pour 1/4 cup water. Close lid and cook for 10 minutes or until done. Wash and soak rice for 1/2 hour. Boil three cups of water in a pressure cooker. Add spices, ghee, and salt along with rice. Pressure cook for two whistles and allow the heat to settle down its own. Or cook rice as you do for ghee rice. When the rice is cooked allow to be warm and mix with prepared prawn masala. Serve with pickle, raita etc. Yummy.Drooling here.Thats truly a good lunch for kids ! have been following u all the time. 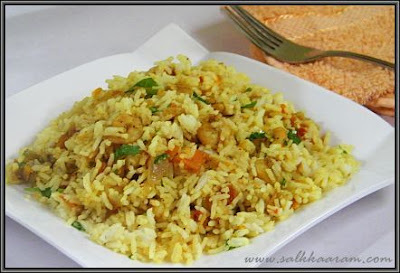 hi seena..im new to your blog,was going through the recips.was thinking what to try this weekend.that much variety you have posted.just a small doubt,can we use big prawns (not tiger prawns) wont get small prawns which we get in our naadu.have heard small prwans tastes good.for pulav can i use the big ones?